This CoinNews photo shows an American Legion 100th Anniversary 2019 Three-Coin Proof Set, one of the seven U.S. Mint products produced in recognition of the Legion’s centennial. The U.S. Mint sold 3,525 sets in their first day of sales. Counting those in the set and those offered individually, the Mint so far has sold 39,671 American Legion Commemorative Coins. Released Thursday, product options include proof and uncirculated editions of $5 gold coins, silver dollars, and clad half-dollars as well as a three-coin set with each denomination in proof. Nearly half of the allotted sets are gone but plenty of the individual coins remain. Altogether so far, the collection of coins has realized over $3.6 million. All but the silver and half-dollars had initial household order limits. Those limits were removed today at noon EST. 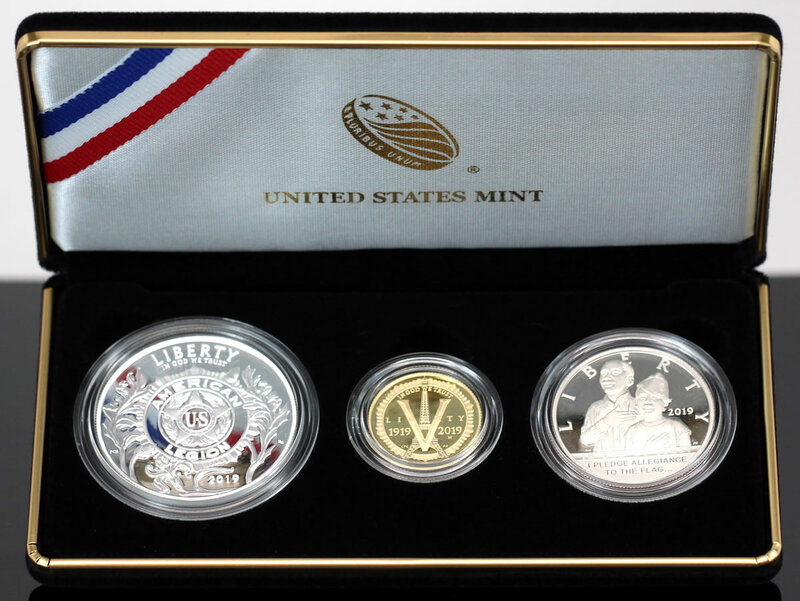 Buy American Legion 11 100th Anniversary Commemorative Coins from the U.S. Mint’s commemorate online store. Orders are also accepted by telephone at 1-800-USA-MINT (872-6468). I know it’s early, but talk about sagging sales. Too much product!!! Why anyone would buy the proof half for $27.95 is beyond me. WAY overpriced. You could 4 proof American Innovation dollars for that much. Crazy. Clearly, the United States Mint is out of touch with the small collector with these ever escalating prices. Anybody still remember when a proof set was only two and change?